Kids have played with hoops for thousands of years. Twisted grape vines kept children amused in ancient Egypt. The Greeks used hooping as a form of exercise. No company or single inventor can claim that they invented the first hoop. Around 1300, hooping came to Great Britain and homemade versions of the toy became very popular. In the early 1800s, British sailors first witnessed hula dancing in the Hawaiian Islands. During their stay, the soldiers realized the resemblance of the movement of the hips of the traditional hula dances to the movements of people that go hooping…and the name “hula hoop” came together. The hoop gained international popularity in the late 1950s and was eventually inducted into the Toy Hall of Fame in 1999. Hoop Chase: Roll hoops on the ground in an open area. Children have fun running, and catching the hoop, and then shouting, “I Gotcha!” Add to the fun by rolling more than one hoop at a time and see which one the child decides to chase. Ring the Target: Set up a target such as a cone (SETC) or a gallon jug (filled with water or sand to weigh it down). Have children stand in another hoop (HOOPLA) a distance away from the target and toss or throw a hoop to land around the target. Start close and slowly increase the distance. Make a Basket: Hang the hoop (“basket”) from a tree branch or some other spot where balls can be safely thrown. Have children stand in another hoop a distance away from the basket and toss or throw a ball (SOFTFOAM) or bean bag (CBB) through the basket. Start close and slowly increase the distance. Around the World: Have children join hands in a circle with a hoop (LGHOOP) hanging from one person’s arm. When play begins, the person with the hoop must step through it and pass it to the next player without letting go of their hands. The next player does the same thing. The goal is to get the hoop back to the starting player with no one letting go of their neighbor’s hands. I like to add some music (“I Want to Hold Your Hand” by The Beatles) while the game is being played. Hoop Jumping: Like rope jumping but using a big hoop (LGHOOP). Hold hoop in front of your body. Step over the hoop. Move your arms forward and swing the hoop over your head. Let the hoop hit the ground. Jump over the hoop, taking off and landing on both feet. Continue practicing these steps until you can continuously jump over the hoop. Hoop Obstacle Course: Thread one pole (POLES) horizontally through lower level holes in two cones (CONES) to make a crossbar for jumping over. Place four hoops (HOOPLA) in a hopscotch pattern for children to jump into (first one hoop, then two hoops side by side, then one last hoop). Then make a tunnel with four cones (CONES) and two large hoops (LGHOOP) (lay two cones on their sides and across from each other, insert hoop into top notch. Duplicate with the other two cones and the hoop). Have children go through the tunnel on hands and knees. Now give children a hoop to roll in and out of a zigzag pathway made by placing 4-6 Hop Around Steps (HOPPA) in a row, four feet apart from each other. Finish the course by having children Ring the Target (see set up above). 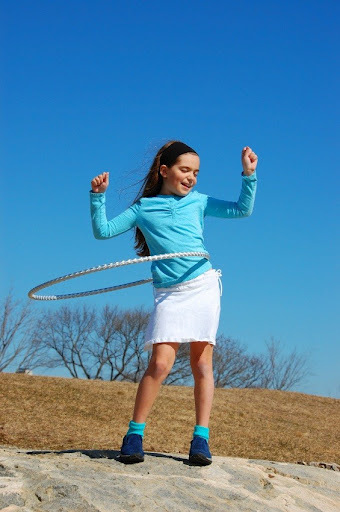 Provide enough hoops for each child to have one…and “Hoop-Dee-Do” let the fun never stop!